What is happening to the markets today? I am not cool today! just to name a few select trends that are working. Plus, the big trade of the year is still ahead of us, although its beginning to look like we may be closer then we thought. I am sorry, I wish I were as cool as you. I am trying. The big trade of the year is NNVC, you said by 2014...I hope you are saying it will be closer. I know the signals on NNVC said it will decline, but I did not sell, I believe and hold my shares close. You still give me hope..since I have found this site, I am trading better. Is TZA a good buy? Forgive me for my emotions. As for TZA, it is still in a Daily Sell mode, but is getting very close to it's reversal Long price. If it closes above that level (it is in last night's trend tables), then it becomes a Buy. I am new to this blog and enjoy your posts here. 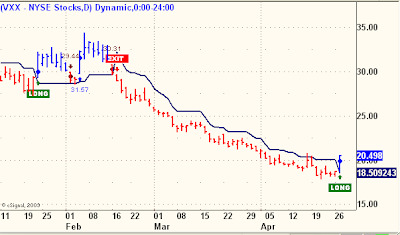 Regarding your recommendation of VXX, how do your feel about buying options on the VIX? (VXX is buyable, but has no options).